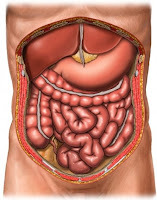 Gastroenteritis is an inflammation of the stomach and the small bowel, Gastroenteritis (also called intestinal flu, traveler's diarrhea, viral enteritis, and food poisoning) is an inflammation of the stomach and small intestine that is self-limiting. The bowel reacts to any of the varied causes of gastroenteritis with hyper motility, producing severe diarrhea and secondary depletion of intracellular fluid. The stomach and small bowel react to any of the causative agents with inflammation and increased gastrointestinal (GI) motility, thus leading to severe diarrhea . Gastroenteritis is a common disease throughout the world, and often outbreaks occur in epidemics, especially among people who are living in crowded conditions. Gastroenteritis occurs in people of all ages. It's a major cause of morbidity and mortality in underdeveloped nations. In the United States, this disorder ranks second to the common cold as a cause of lost work time and fifth as the cause of death among young children. It can be life-threatening in elderly and debilitated people. Patient's bowel elimination pattern will return to normal. Maintain weight without further loss.